← Me & The Beastie Boys…. We missed last week b/c we were visiting with Auntie H and Baby A2, but this week we’re here to update everyone on A’s developments, which were plentiful this week! On 10.13.10 she ate rice cereal for the first time! 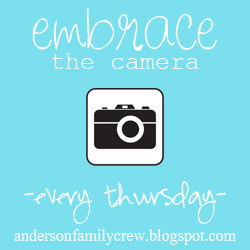 We went over to Auntie H’s house very very early in the morning to eat, and since I literally got in the car with a sweatshirt over my pj’s, I didn’t remember the camera…but there are some photos on H’s camera and I’ll have to get my hands on those! She did GREAT! She eats like a pro! SO good in fact, that she really wants to eat everything….anything really. But we’re sticking to cereal for now. This week she got oatmeal and she really loves it. There’s a ton of “eeeeeeeeeeeuhgh” when the spoon isn’t getting to her mouth fast enough! On 10.19.10 she had 3 other firsts…1. FIRST TOOTH!!! Her first tooth poked its little head out! Its really not out far enough for novice’s to see, but we were in the park yesterday and another mother saw her smile and said “oooh she has the start of a tooth there! !” I was so proud 🙂 2. FIRST BREADSTICK @ THE DINER!!! We (Gramma, Auntie H, Cousin S, Baby A & I) probably go to the diner at least 4 times a week for lunch. Poor A has had to watch us eat and sit patiently until we’re done playing with some plastic teething toy, or a spoon. Tuesday her world was changed! We gave her a breadstick to teeth on….and she loved it! 3. 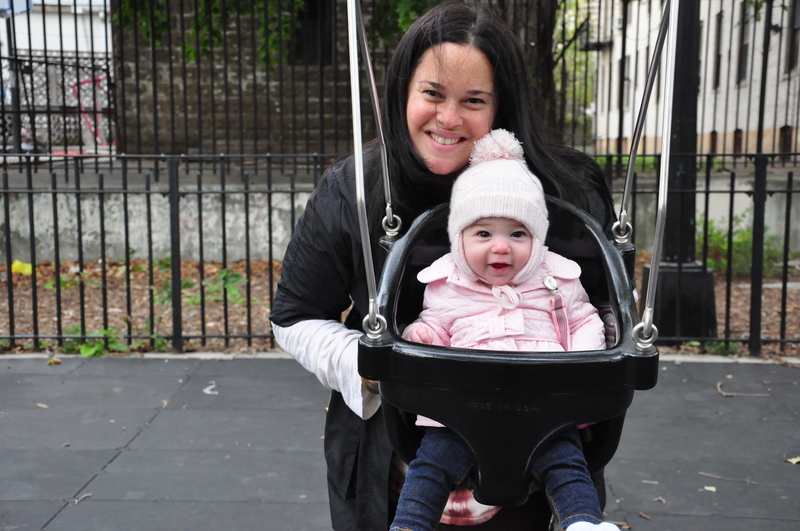 We went to the park and she went on the swings! She thought it was great – even though it was freezing! Oh yea – and this…. 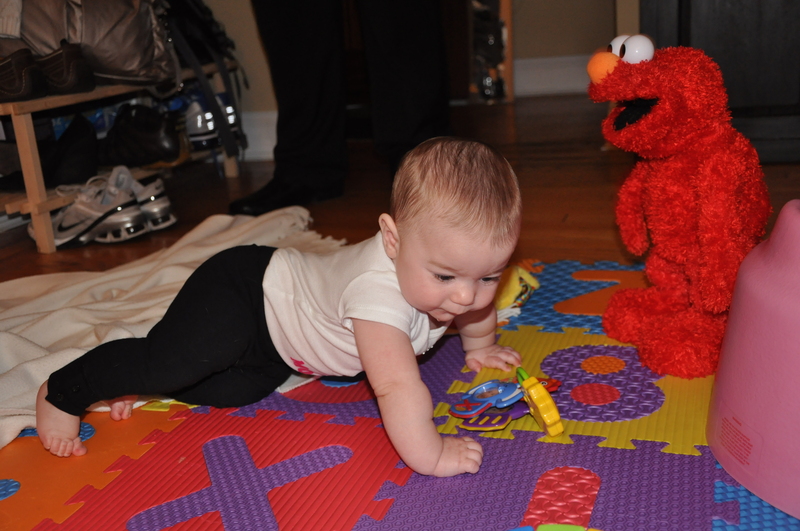 A's gonna get you Elmo! CRAWLING!!!! My life is over…and hers has just begun! She’s making her way to being able to get more than 2 inches at a time…but she’s learning quickly! I can’t wait until we’re living in a ranch! Hooray for no baby gates! 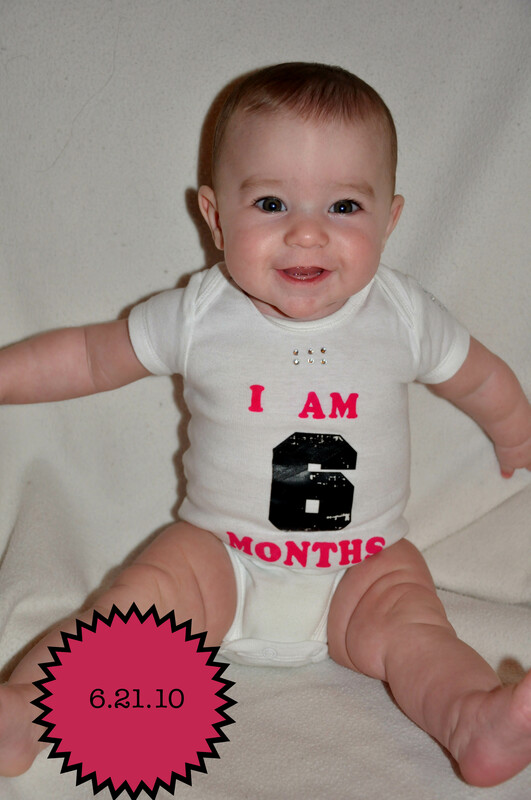 this first “i am 6 months old” picture is adorable! I love watching Ava grow. Her smile is so beautiful. Her first tooth? Waaaaaaaa 😦 I wish I could see it poking out. Please take a picture of it when you can. It’s nice to know she has a good appetite… is that quality from both families? Must be. Miss you guys! I love that face!!!! Miss you lots!